Kona Sea Villas, Kailua Kona – STILL LOOKS NEW! This beautifully maintained ocean view condominium is being sold fully furnished. It offers a private garage, large loft space and central air conditioning too! When you begin looking at Kona Condos you will quickly discover properties with a private garage are rare. If you spend much time in Kona you will soon discover that at these lower elevations, unless you are absolute ocean front, central air will make life much more enjoyable. This is a second floor unit so the ocean views are great! It has and open floor plan, 2 Bedrooms, 2 Full Baths and a Large Loft you can use as a den, office, media room or convert into a 3rd bedroom by adding a closet. The well stocked kitchen has granite counter tops, stainless appliances, space for a small table and a breakfast bar. The living area is adjacent to the lanai where you will most likely take your meals. 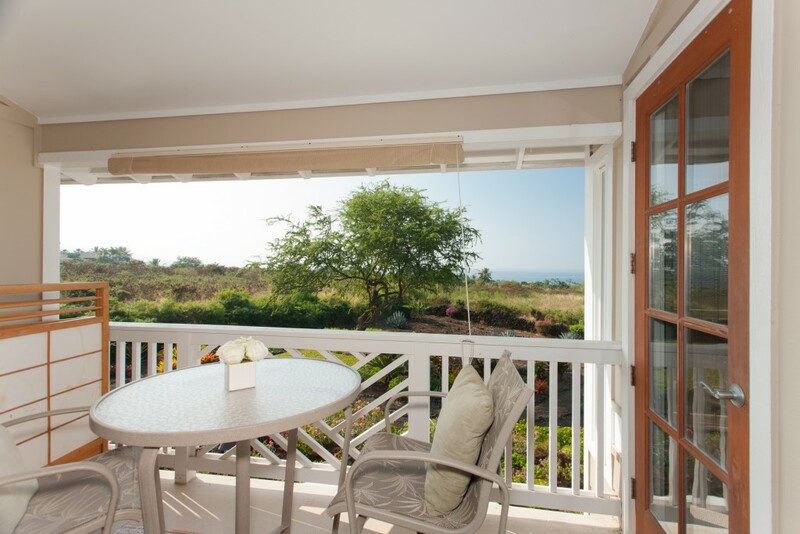 The lanai may also be accessed from the master suite which offers ocean views, two closets and a private bath. On the mauka (mountain) side of the house you will find the guest suit with a pleasant view of the pool complex. Tucked beneath the loft staircase is a stack washer dryer. Because of its location and orientation within the complex we think this is the very best Kona Sea Villas. Because Kona Sea Villas is lower density than most similar properties we think it is the very best of the newer Kona Condominiums. The thirty day minimum rental period is strictly enforced. The documents allow one cat but no dogs, except service animals. This property is easy to see with short notice so call your Realtor or the Listing Agent.